One of the most popular foods at street fairs in NYC is Mexican Street Corn. 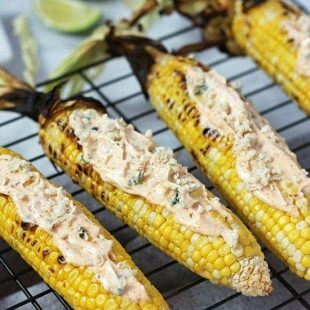 Freshly grilled sweet corn is coated with a mixture of vegan cheese and spiced mayonnaise to make this Vegan Street Fair Corn even better than the original! I’m lucky to have lived right outside NYC most of my life. It’s so fun to go and see all the sites and indulge in tasty food. Because New York City is so diverse and there are so many ethnicities making their home here, choosing where to eat is always fun. Sadly, the food choices are not always vegan. But thanks to the internet we now have awesome bloggers recreating many classics. Today I have a veganized recipe for you that is so delicious and easy to make. I’ve been to street fairs both in NYC and NJ but have never tried the street fair corn that is very popular at them. While tasty looking, I knew the creamy corn would not be dairy-free so I’ve always had to skip out – until now that is. Today I bring to you Vegan Street Fair Corn from the book NYC Vegan! 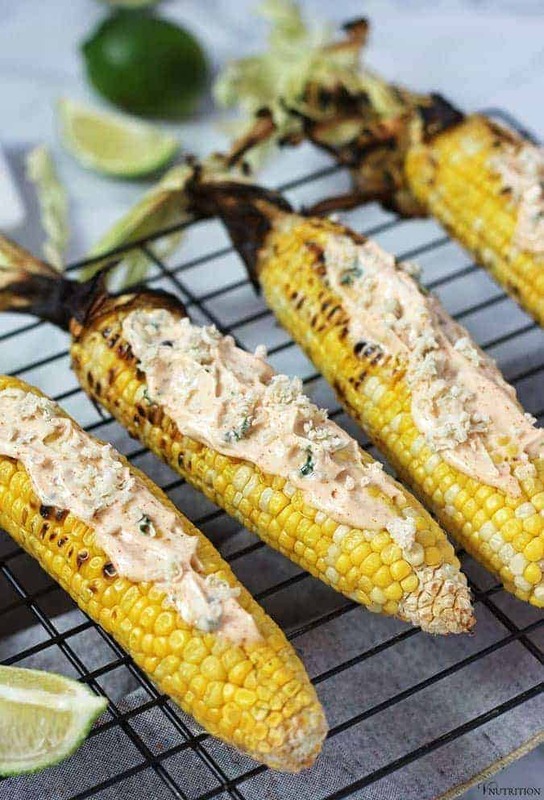 This corn is grilled up nicely and smothered with a spicy vegan mayo and plant-based cheese to make a tasty side dish for any BBQ. It would seriously impress even non-vegans. Can I tell you that I was amazed and impressed at how good this was? I figured it would be good but I snarfed down two ears right after taking this picture – then had to stop myself from eating the other two I saved for Matt. The grilling of the corn and making of the mayo only took about 10 minutes total! So easy! Because of my love of New York City, I was so happy to have the chance to review the new book NYC Vegan: Iconic Recipes for a Taste of the Big Apple by Michael Suchman and Ethan Ciment. Michael and Ethan are from Brooklyn and are the guys behind the awesome blog VeganMos and the creators of the Vegan Street Fair Corn recipe. NYC Vegan includes classic recipes like Manhattan clam chowder, Waldorf salad, New York-style cheesecake, black and white cookies, and zeppoles. Other cultural specialties like Polish pierogis, Italian lasagna, Jewish brisket, Dominican arroz con maíz, Greek avgolemono soup, and Puerto Rican mofongo are also included. 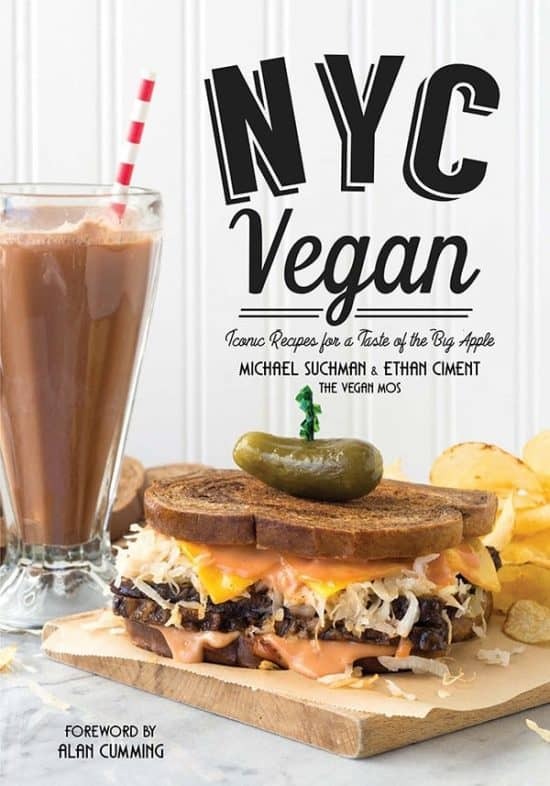 Michael and Ethan also have a chapter that lists vegan restaurants and foods to try in NYC which is a big help for those traveling to NYC or for someone like me that wants to check out new places to eat. I hope you enjoy the Street Fair Corn as much as I do! Share your pictures on Instagram too and tag @v.nutrition and #vnutrition so I won’t miss it! If you make this recipe, let me know what you think by ★ star rating it and leaving a comment below. One of the most popular foods at a street fair in NYC is Mexican Street Corn. 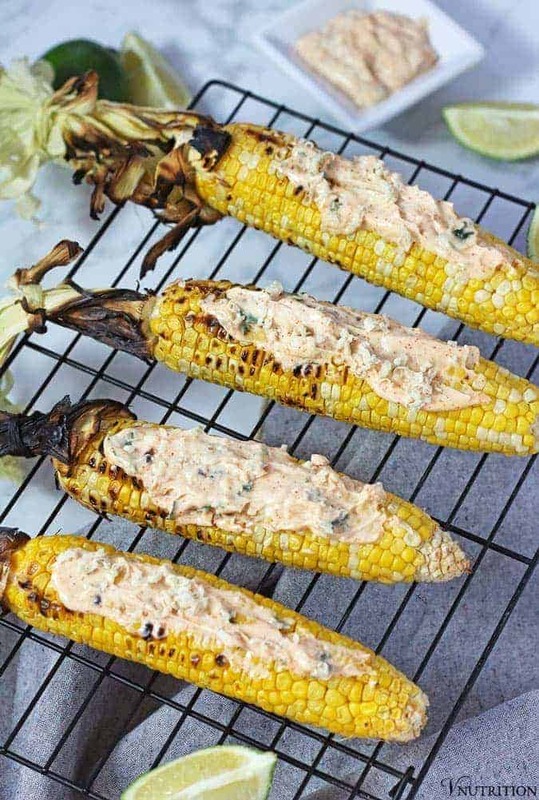 Freshly grilled sweet corn is coated with a mixture of cheese and spiced mayonnaise but this Vegan Street Fair Corn is even better than the original. This recipe is from NYC Vegan, copyright © 2017 by Michael Suchman and Ethan Ciment. Used by permission. Heat a grill for direct-heat grilling, or heat a grill pan over high heat on the stove. While the grill is heating, in a medium mixing bowl, combine the mayonnaise, sour cream, nondairy parmesan, chili powder, garlic, and cilantro. Stir until completely combined. 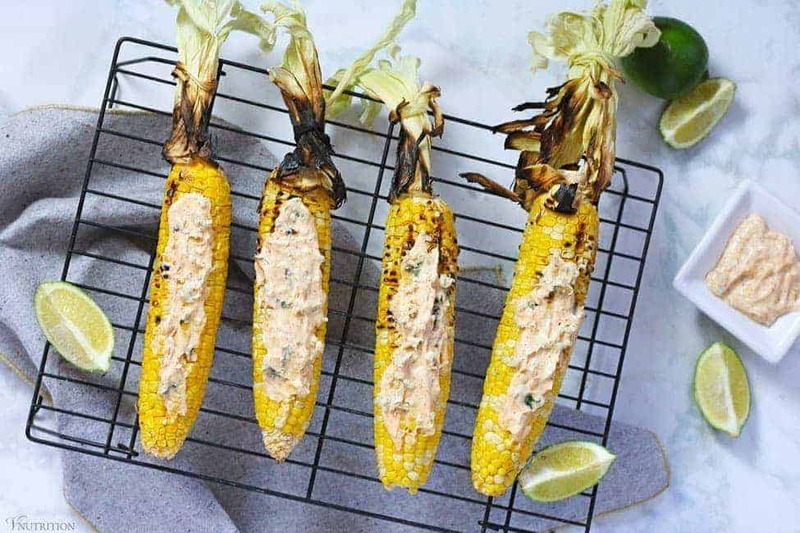 Place the corn directly on the hot grill and cook, rotating occasionally, until cooked through and charred in spots on all sides, about 8 minutes total. Remove the corn from the grill and transfer to a serving plate. Use a pastry or basting brush to generously coat each ear of corn with the mayonnaise mixture. Sprinkle with extra cheese and chili powder and serve immediately with lime wedges. * Feel free to use any vegan parm you enjoy. This book sounds great and makes me want to plan a trip to NYC soon! Can’t wait to try this recipe and thanks for the opportunity. If you do ever plan a trip out here you’ll have to come see me! Don’t forget to enter – I saw you tweeted but I don’t think you entered your tweet into the raffle. I’ve made this recipe twice since I received the book. It’s so good! It is soooo good! I am making more this weekend! I’m would love to visit NYC again. I really enjoyed the falafel. I would have to take several trips to try all the foods and restaurants that I want to experience. NYC is really fun right? It’s so hard to get in everything all in one trip. I live close there are still so many places I need to try! YUMMMMYYY! You know what? I’ve never actually had corn on the streets, but I’ve always wanted to make some at home. This looks amazing! It’s really tasty Randi! I’ve made it twice now. It’s a nice change for regular grilled corn. Been to NYC MANY years ago. Don’t remember what I ate. I was with a youth group that went to see Fiddler on the Roof. Thanks Kari! I’m not sure if it’s an NYC thing or not (besides Mexico) – a few people have told me they haven’t heard of it either. 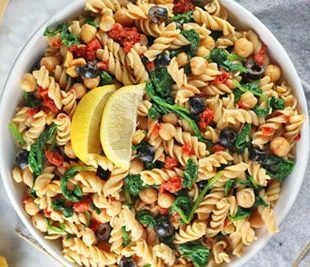 I am one of your new followers – every recipe I have tried has been a big hit! Thank you and I would love a cook book please! Gisela, thank you so much for the lovely compliment! I’m so glad you’re liking my recipes! Good luck with the raffle! I would love to have a recipe for brisket, or at least for the “meat” so I can use it in my brisket recipe! I haven’t been to NY. Lydia, the brisket of seitan from the book looks amazing! Now don’t laugh, but a pretzel!!! Like I’ve seen in movies!! Giant and soft and salty and warm ~ ohhhhh, man!!!! NYC pretzels are sooooo good so I don’t blame you, Arvie! They actually have a recipe for them in the book. Your pretzel and Phantom idea sounds awesome to me – I’d partake in that kind of day anytime! This looks like a yummy corn recipe! I should try it out this summer. Fresh corn on the cob is my favorite. I love fresh corn on the cob too Jennifer. This was a nice way to switch things up a bit from my regular grilled version. i have been to NY but did not have any of the iconic street food. I used to love NY style cheesecake so I would like a vegan version of that. or the black and white cookies. NYC Vegan looks like it has a lot of fun and exciting recipes! Also, I love corn on the cob, it won’t be long before it’s in season! Thanks! Yes, the book is really fun! Corn on the cob is one of my favorites too! This looks incredible!!! Love the vegan version and this cookbook. I feel like such a goober… somehow I thought you lived in California! Doh! If I’m ever back in NYC we’ll have to hook up! I’m always looking to move to California so that would fit. 🙂 Yes, if you’re ever around NYC I’d love to meet up! All I remember from my trip years ago is lots of pizza and pasta. I’d love to try a black and white cookie though (or make one)! Yes, so much great pasta and pizza there. The black and white cookies weer my favorite growing up! I have never been to NYC but would love to go. Thank you for the chance. I better there is some good food ideas in this. Visiting NYC has been on my bucket list for decades! One day, most likely after another decade though, I will get there! I want to see the sights and eat all the food I can! I have MANY years ago. The only street food I got to try was pizza; I was NOT disappointed!!! Yay!!! Looks like I actually won the giveaway but I don’t know how to claim it. Thanks for your help!!! Sandy, yes you won! I emailed you 2 days ago. If you didn’t get it, go to my contact page and get my email address and email be back! I’ve seen street corn at the local market and it always looks good, but I just assume it’s not vegan (buttery evilness). Yeah, I’m sure most of that is not vegan which stinks. I was really impressed how tasty this recipe is!